Those of you who are familiar with this blog know that I'm a huge fan of Pinocchio: Vampire Slayer (words such as 'genius' and 'fantastic' may have been applied). So you'll have a pretty good idea of how excited I was about the sequel (hint: very). I even got a pdf review copy this time (thanks, Van! ), although I'm going to have to go out and buy a hard copy too. Not just because I'm obsessive about my book collection; it was that good. I was immediately drawn in by the cover artwork of Pinocchio: Vampire Slayer and the Great Puppet Theater (henceforth referred to as P:VS 2). The cover of the original was good but this one just blew me away. I get excited that way about art, especially when it includes a wooden puppet in a classic Shakespearean pose holding a smoking vampire skull. If that doesn't entice you to delve into the book, you probably shouldn't be reading a blog about vampires. P:VS 2 starts off with a clever re-telling of not only the first P:VS, but also Carlo Collodi's original story. Finally--a recap that's creative and interesting rather than merely annoying exposition. From there the sequel begins and, much like P:VS, the story is full of all you would expect and more: drunken debauchery, fortune telling, armed puppets, magic, ghosts, romance, adventure on the high seas, use of the word 'vainglorious,' daring rescues, family bonds, The Merchant of Venice, and a fire eater. The further in I got the more engaging I found P:VS 2, and toward the end I was scrolling through the pages as quickly as I could to find out what would happen next. I had to go back a few times to take in the artwork as well as the action. Ultimately it ends on a cliffhanger leaving the impatient among us counting the days until the next volume comes out (no word on that yet). The artwork is just as good as it was before (although still only in black and white), and Higgins makes good use of the page, although panels are occasionally cramped. There are some particularly nice panels--a streetscape divided into four rectangles (like a triptych, only four rather than three sections--is there a word for that? ); vampire slaying displayed jaggedly; insets highlighting details. Higgins also plays with perspective, approaching scenes from different angles with much success. And of course, some of the best artwork is of Pinocchio himself (his facial expressions especially are great). It's amazing how much personality can be imbued into a character who really is wooden. Other characters are successful to varying degrees. Some stand well on their own and are strong enough to carry the story when Pinocchio is occupied elsewhere. Others aren't well-enough developed--by the time they start getting interesting they're gone. More attention could have been paid to some of the lesser characters, given there were 177 pages to work with. The vampires also have a tendency to blend in with one another rather than having distinct personalities, although that's probably deliberate and, in any case, works in the context of a plague of bloodsucking fiends. Appearance: Undead human, with ragged claws and pointed teeth. Cloaks (similar in appearance to monks' robes) are favoured attire, although they will branch out when the occasion calls for it. Strengths: Subterfuge, strategy, blood lust, magics. Weaknesses: Stakes, pointy wooden objects (they burst into flames when staked, then turn to dust). Mythology: Vampires are cursed beings robbed of their humanity; they need blood to remain immortal. One drop of cursed blood will turn a mortal into a vampire. All vampires seem to owe allegiance to (and work for) "The Master." Vampire: We are too many, puppet. Our master will be so pleased with a gift of your dismembered corpses. Minion 1: Please the master! Minion 3: Yay, it's dismembering time! Pinocchio: I love your outfit. It's so sparkly. Vampire: Why, thank you. I wanted something that took away from the whole morbid undead thing. Read my review of Pinocchio: Vampire Slayer. 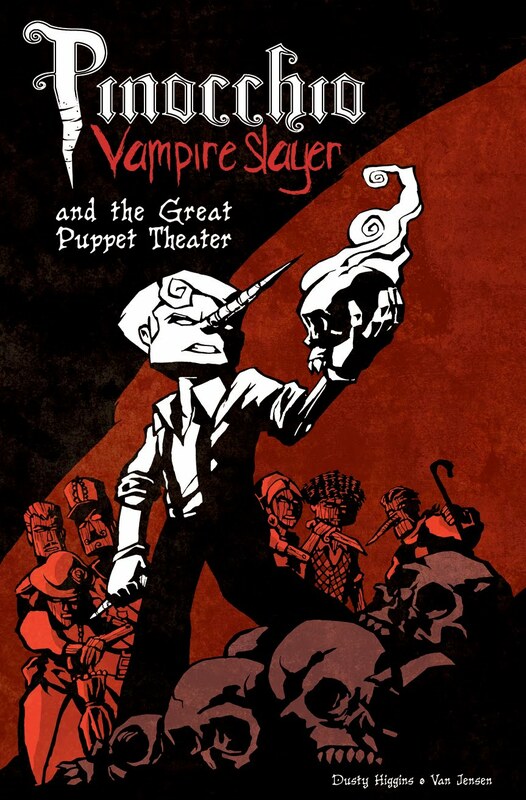 Pinocchio: Vampire Slayer and the Great Puppet Theater; drawn by Dusty Higgins and written by Van Jensen. From SLG Publishing.